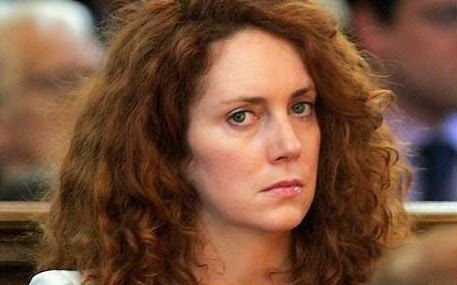 In the wake of Phonehackgate and the closure of the Screws, there was much speculation as to the future career path of the twinkle-toed yet domestically combative Rebekah Brooks, with hints being made that, despite securing a pay-off from the Murdoch empire of just over £16 million, Creepy Uncle Rupe would find a place for his favourite Brit somewhere - but perhaps not in the UK. The speculation was fuelled further in October last year when the Guardian’s Jon Swaine reported form New York that “Rupert Murdoch’s News Corporation is considering a return to the payroll for Rebekah Brooks, the former editor of the Sun and the News of the World, with a senior job in New York … Brooks has spent much of this week in the US and was in the Sixth Avenue offices of the media group in Manhattan on Thursday”. What kind of post, though, would Ms Brooks be taking up? The newspaper industry Stateside is a rather different beast to its UK counterpart, although she might have recognised the Murdoch tabloid style in titles like the New York Post. Rupe, though, had apparently instigated the process: “Murdoch, who has made clear his continued admiration for the former chief executive of his UK newspaper division, is understood to be personally behind her potential new appointment”. Well, now we know: the Guardian has returned to the story, noticeable by its being almost alone in reporting it (the Mail has also given it some coverage), and yesterday it was Lisa O’Carroll who brought the news. “Rebekah Brooks is close to being rehired by Rupert Murdoch in a permanent position heading up his search for new online investments”. Do go on. “There were unconfirmed reports on Sunday that she would be heading Storyful, a social media news agency started by the former RTE current affairs present Mark Little. It was acquired by News Corporation in 2013 for $25m. The Financial Times reported that Brooks would spend some time in Dublin where the operation is based. News Corp declined to comment”. That’s an interesting one. That Ms Brooks is on her way to the USA is not in doubt - the Mail asserts “The former News of the World editor has made the permanent switch from Oxfordshire to New York, with husband Charlie and three-year-old daughter Scarlett”. But what she was famously good at when at the Screws and Sun was her networking and schmoozing. The world of online businesses may not work quite the same way. There was also the tendency to behave - as she and Murdoch Junior did when confronting Simon Kelner at the Independent over his “Rupert Murdoch won’t decide this election - you will” claim - in a way that justified Tom Watson’s likening of News Corp in the UK to a mafia operation. That style will not play well either in e-commerce, or indeed in New York. So Ms Brooks is in for a steep learning curve - if she intends to relaunch her career. Whatever her future, though, it isn’t in the UK. And very few seem to have noticed.